This is part two of a three-part report from Chile and Argentina. There are links to Part 1 and Part 3 at the end of this article. The Maipo Valley is the birthplace of the Chilean wine industry. It was in the 19th century, after Chile gained independence from Spanish rule, that the valley saw massive expansion and the creation of huge estates by wealthy local families and businesses, many of which are still headquartered in Maipo today. It is a fine place to grow wine grapes, with good soils and climate along the length of the Maipo river, and being very close to the capital city of Santiago for trade and commerce. As Chilean winery owners travelled to Bordeaux and beyond, they brought back trunks full of plant materials, but also ideas and inspiration. Maipo’s boom years began. With around 12,500 hectares of vineyard it remains a significant valley. As with the rest of Chile’s established valleys, vineyards have been spreading east towards the Andes and west towards the coast, finding new soils and microclimates and defining sub-zones. All of that is in search of increased quality and greater diversity, but the greatest concentration of vineyards lies immediately south of Santiago, and that in itself is bringing intense pressure. Today some of the best-known estates begin in the suburbs of the city, surrounded by housing and industry. The Santiago sprawl sees land for building in very high demand, so agricultural land really does need to produce maximum profit to withstand the heat of the building boom. Though it is a threat, it is also an opportunity. It is one extra reason for established wine estates to re-think their position in the market, examine their quality, and ensure that the wines they produce will take them confidently forward. One of the biggest Maipo names is Viña Santa Rita. Their 3,000-hectare estate in the Alto Jahuel district (600-hectares planted to vine) was founded in 1880, and is today one of the most visited wine tourism attractions in Chile. 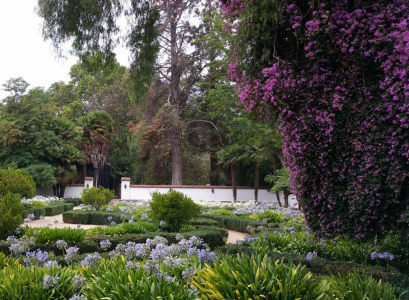 Today, stunning formal gardens, a thriving restaurant, woodland paths, picnics and bicycle tours all draw in crowds as does the legend of the ‘Patriot Cellar’ where 120 exhausted independence fighters were given refuge and hidden from Spanish forces in 1814. But for such a deeply historic wine estate I was to learn over a day with Santa Rita that their story is also about change. “We are not afraid to say that we made mistakes,” says Head of Wine Growing, Eduardo Alemparte. “The important thing is that we have learned from them.” I ask what the mistakes were? “Water stress is one,” he says, “we put too much stress on our vines which made them susceptible to disease – producing very weak plants.” Another problem, if not a ‘mistake’, is an insect called Margarodes that attacks vine roots. Found only on the valley floor where flood irrigation was historically used, it continues to affect quality, though a project with The University of California Davis is looking to introduce a nematode that will control it. For these and for the commercial imperative of maintaining and improving quality, Santa Rita has already embarked on an enormously ambitious project to rip-out and replant 520 hectares of its 600-hectares of vines at a cost of $20 million US. 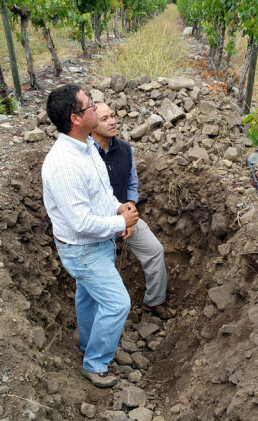 Eduardo took me on a tour of nine ‘calicatas’, inspection pits dug between rows of vines, to show me how a mission to really understand their soils was at the heart of the project. All of this work is part of project they have dubbed ‘WISE’ – WIne and SEeds. 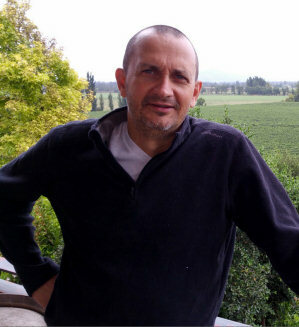 “In many plots we are also concentrating on planting a massal selection of our own vines: we want to know how Chilean grapes can be at their best, rather than plant with French clones.” He makes a point that he will re-emphasise throughout the tour: “Above all we want to manage the vineyard so that the vineyard follows us, rather than we follow where it decides to go.” He explains that too often in the past they have played ‘catch-up’ with the vineyard, reacting to correct or manage some aspect, rather than setting a course which the vineyard will follow. As we inspect various blocks – one full of small gravel stones in clay (“Very good for Merlot,”) one showing strata of rounded stones and clay (“Perfect for Cabernet Sauvignon,”) it becomes obvious that Eduardo is leading the team here with enormous enthusiasm and thirst for knowledge. It is heartening and remarkable that such a large and established producer as Viña Santa Rita is going so profoundly and whole-heartedly back to basics in pursuit of the next generation of quality wine in Maipo. Viña Carmen’s vineyards in Maipo, which adjoin Viña Santa Rita’s estate, have their own special place in global wine history. The really important date is not 1850, when the estate was founded, but 1994. It was here that a discovery by French vine scientists was to change Chile’s place on the global wine stage. In an ordinary looking vineyard, the vines untouched to this day, they pronounced that plants labelled as Merlot were in fact the almost forgotten Bordeaux variety, Carmenere. The rediscovery of Carmenere thriving in Maipo changed the course of the whole Chilean industry. 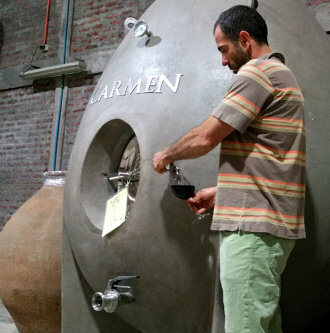 In 1996 Carmen released the world’s first pure Carmenere wine. I vividly remember buying, loving and recommending this wine here on wine-pages: the first releases were labelled as Grande Vidure, not Carmenere, for legal reasons, but it was an eye-opening wine for Chile with its abundantly creamy and velvety black fruit, yet structure too. Since then Carmenere has become an essential part of most of Chile’s top ‘icon’ wines, a signature variety, though not to the same extent as Argentina’s Malbec. And it remains very close to the heart of Viña Carmen. I met up with head winemaker Sebastián Labbé, fresh from a surfing holiday, bright as a button and filled with enthusiasm. He joined Carmen in 2005, but after more than a decade the vineyards and winery are as much his playground as his workplace. He showed me the variety of experimental tanks and vessels were he concocts small batches of trial wines, everything from Blauer Portuguiser to Muscadelle. Right: sampling direct from a concrete ‘egg’. Having met Chief Winemaker Arnaud Hereu (right) and owner Dan Odfjell in the UK on a number of occasions, I was delighted to be able to at last visit the lovely estate of this high quality Norwegian-owned company in the Maipo Valley. Sitting with dramatic views over their vineyards, Odfjell’s is one of the first gravity flow-designed wineries in Chile – designed by the family’s own Laurence Odfjell, who as an architect has produced some of the most striking wineries in Chile. Part of that refinement is in the winery’s use of oak. “I used to buy 300 new barrels per year,” says Arnaud, “Now I buy 50. It’s a gradual change, little by little reduction of oak.” The estate is also certified organic, and all vineyards are certified biodynamic too (though not the winery – “it’s just too expensive, as 2% of the invoice goes to the certifying body,” says Arnaud). 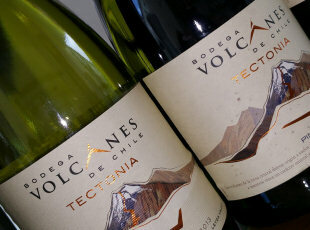 Chile has 2,900 volcanoes, but Volcanes de Chile appears to be more than a neat marketing concept: volcanic soils influence wines so specifically in places like Etna in Sicily or Vulture in Basilicata, that an important aspect of the project will be to capture some of that volcanic soil influence, “Though some soils give more influence than others,” says Pilar, “depending on the age and the decomposition of the volcanic material.” Already they are sourcing fruit from vineyards with volcanic influence in various regions, but the final phase of the project plan is to have vineyards – yet to be planted – that will be as close as they can to the foothills of a volcano. Pilar tells me that they have already been collecting data from what they thought was a perfect site, but there were just too many below zero degree nights at around harvest time to make it viable. Their La Higuera Estate in Maipo has volcanic soils formed by pyroclastic eruptions, whilst their vineyards in Leyda are rich in magnesium, potassium, calcium, sodium, iron and silica from volcanic activity, and in their Cauquenes Estate in the Maule region large granite intrusions, formed from cooled magma, have been eroded over time to create permeable, mineral rich soils. 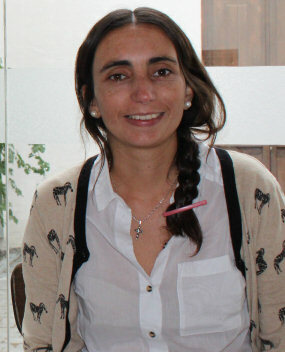 But the project is seeking out volcanic influenced fruit from across the length of Chile. I was particularly taken with a Pinot Noir from Bio Bio in the deep south, but the project is far-reaching and exploratory, and already winning major international awards. It is clearly one to watch. Whilst in Santiago I was delighted when Wines of Chile arranged an overview tasting of fifteen wines from some of Chile’s best estates including Tabali, Viña Leyda, Montes, Casa Marin, Cousiño Macul and Caliterra.